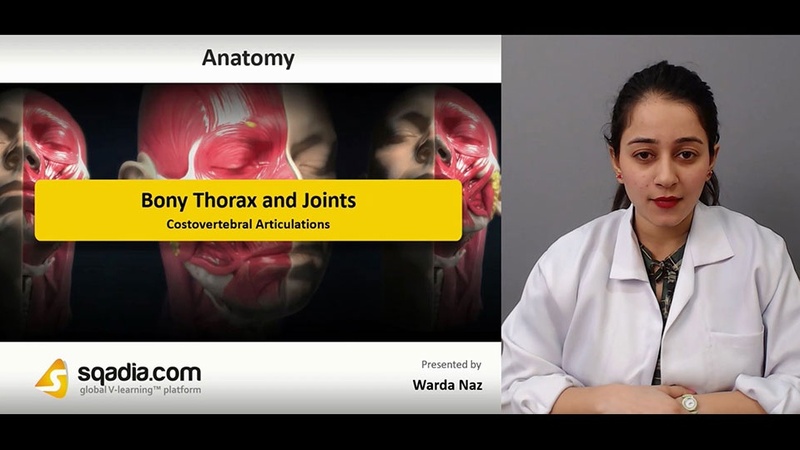 In this lecture ´´Bony Thorax and Joints´´ are explained. Section one is about ‘‘Thorax’’. Educator begins by illustrating bony thorax. This is followed by explanation of thoracic cage contents. After that anterior articulation is focused. Then information about palpation of ribs is given. Furthermore, educator emphasize on rib dislocation. Lastly, thoracic inlet along with its significance is elaborated. Section two is about ''Sternum and Associated Joints''. Initially, sternum bone is discussed. After that light is shed on manubrium. Then body of sternum is elaborated. Following this, educator explains The Xiphoid Process. Alongside, answer to the question can you tell where is angle of louis? is also covered in this part. Moving onward, sternal angle (angle of louis) is pursued later on. Educator also notify about manubriosternal and Xiphisternal joints. Next subject of discussion is sternoclavicular joint. At the end, costochondral and interchondral joints are also highlighted. Section three is about ''Ribs''. Earlier in this section, information about ribs along with detailed explanation of categories of ribs is given. Likewise, typical rib is discussed. Then parts of a rib are focused which include head, neck, tubercle, shaft, and angle. Moreover, atypical ribs are also covered in this part. Section four is about ''Costovertebral Articulations''. In this section, the first subject of elucidation is articular facets. Educator gives detailed explanation of Articular Facets through diagram. Subsequently, superior and inferior facets are highlighted. transverse costal facet is discussed later on. Concluding comments are given on movements at costotransverse joints. Section five is about ''Ligaments of Costovertebral Articulations''. In the beginning educator talks about External and Internal Ligaments which include elucidation of the radiate ligament, the superior costotransverse ligament, and the intra-articular ligament. In the end, transverse section is covered.